We’ve all heard about the importance of self care. We know that unless we love ourselves and look after ourselves, we can’t look after anyone else or love them properly. Each time we read one of those articles, we vow to look after ourselves just that bit more. And then, as it does, life gets busy. Kids need to be fed, brought to a million and one places, homework needs to be corrected. Dinners need to be made, shopping needs to be done, that to-do list in work isn’t getting any smaller. 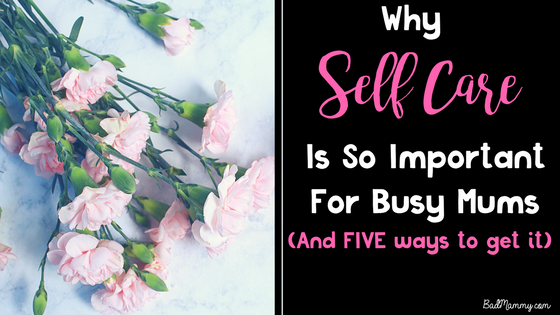 It’s all well and good to talk about “making time for self care” when you have the time to spare, but sometimes that simply isn’t the case. That was my question to my therapist. At the time, I was working a 39 hour week, commuting for an hour and a half a day (thank you Bus Eireann for taking so much longer than necessary), and in a rut. My life was wake up- get ready- work – creche pickup- witching hour – bedtime. I was so tired, I didn’t have evenings. I often fell asleep doing bedtime with my toddler. My diet was falling apart, because I didn’t have the time to care. My partner was working all the hours in the world, he was doing the creche drop off before work, and travelling quite a bit. We were busy. I was busy. I was adjusting to again being a mother who worked outside the home. This was what I was looking forward to so much. And I was miserable. She asked me what I had done lately for me. I drew a blank. There hadn’t been the reading a book I was looking forward to. My closest thing to me-time was my commute where, if I managed to leave a few minutes earlier, I could get a coffee in Starbucks on the way. Yoga retreats and bullet journaling weren’t exactly pencilled in. She hammered home the importance of self care. I protested lack of time, she pointed out that if I continue without it, the time I spent with my son wasn’t going to be worthwhile. My son deserves a happy mother. He deserves a mother who is calm and has outlets for her frustrations, her feelings that don’t make her the best she can be for him. And I need to be not Mammy for a little while. I think we all do. We were all people before we had kids, no matter what age we became parents. I was 22, out of college just over a year, watching everyone else my age travel, go on mad nights out, go for jobs that barely paid but led to incredible opportunities. The me before my child was a confident, outgoing young woman, and I feel that as a parent I have lost some part of that. In trying to be Mammy, I had to hush out the less sensible old me, quieten down some of those dreams and replace them with different ones. While the baby years are all consuming, my son is now of an age where he needs me less. He’s in creche five days a week. He adores the ground his grandmother walks on, and is thankfully very good with friends who have offered babysitting. The door is opening towards having a life alongside having a child. And yet. Still no self care. It can be difficult to turn off Mammy Mode and allow myself some time to be. Writing allows for it a certain amount, it’s certainly why I started blogging. Sometimes the blog can feel like more work though, so I can’t always say it counts as self care. My therapist recommended a massage, but as my back is in bits at times, that can feel like a torture session (good for me yes, stress relieving not so much). Meeting friends for coffee is hit and miss – everyone has such busy schedules, and my schedule after 5pm is far more likely to contain Paw Patrol and fights over when bedtime is than a glass of wine in town. It requires a level of planning ahead, which many non-parents don’t get because they’re able to drop everything on the day, and many times it just feels like too much work, so I don’t do it. Nonetheless, the importance of TRYING to introduce self care into my routine has been impressed upon me. I’ve tried a few different things to ensure that my own mental health is looked after, so that I can be the best mother I can be to my child. It’s not been an easy adjustment; we are used to putting ourselves on the back burner, but it’s been important. 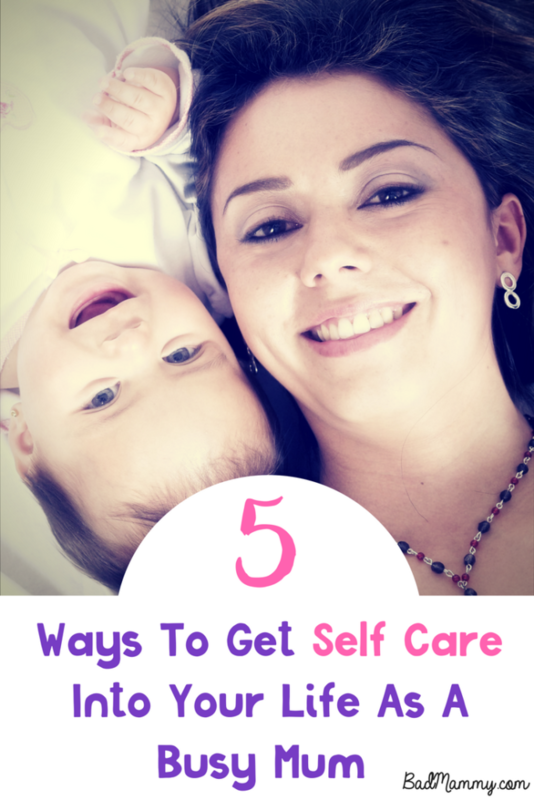 So what are attainable ideas for busy mums with small kids who are in need of self care? 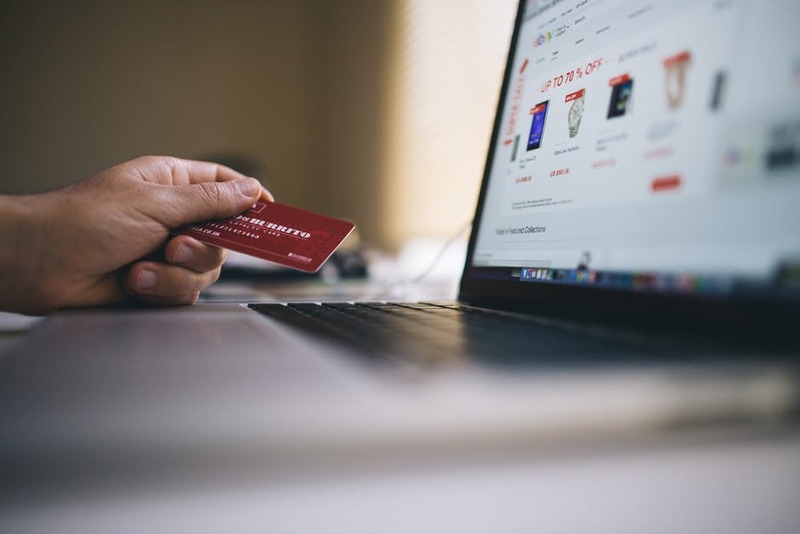 Shopping Online (And using the saved time for YOU). Not racking up the credit card on Amazon necessarily, I’m meaning the grocery kind. There is a special circle of hell dedicated to wandering Tesco with a hungry grumpy toddler who is one biscuit aisle away from a meltdown. We’ve all done it. Instead, set aside twenty minutes and do the grocery shop online if you’re in a delivery area. You can even put it aside as “Mammy is doing a job” time (and have that much wanted glass of wine/cup of tea and biscuit while you’re at it). It cuts out the fear of the supermarket with toddler in tow, and hopefully you can put aside that time that would have taken and do something nice for you. You might manage to get out without any kids in tow, or you might be pushing the buggy. Either way, bring your headphones, stick them in and throw on a podcast that you want to listen to. Find a series that you enjoy, whether it’s motivational, true crime, current affairs or based on a hobby you have. Audiobooks are particularly good for this, especially if reading is something you feel you have less time for these days. You can sign up for a free Audible subscription here for a one month free trial (one free book). These are some of the ones which I found fantastic. If you’re lucky enough to still have a napper (we are hitting the end of naps here, it is NOT a nice feeling), make the most of that time. Yes, the house might be falling down around you, but prioritise that hot shower, that hot cup of tea. Give yourself a few minutes to JUST. BE. When is the last time you did something for the sheer joy of it? Whether that was a karaoke night with the girls, playing a sport, going to a gig or even sitting down with a coffee and writing – when was it? Find something you love, or something you used to love – and try to fit it in at least once a week. Life gets super busy, I know, but finding the time to do something for the fun of it instead of the practicality can make all the difference. Self care is all about doing things to keep yourself sane – doing things we love is a big part of that. Too often we let ourselves slide while keeping the rest of our life in working order. The things that matter to us, our treats, get pushed to the side for things for our family. So, you need to take a thing – whether it be getting your hair done, getting your nails done, whatever is something that makes you feel whole and human, and make it an appointment you HAVE to make. Treat it like you would treat any other necessary medical appointment. This is for your mental health, which is just as important. If you don’t look after you, you won’t be able to keep running on steam and get everything else going for much longer. So take the time. 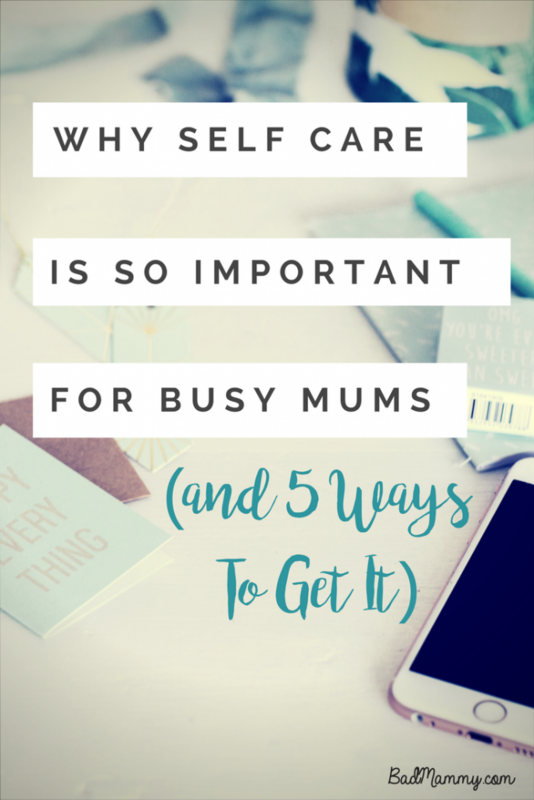 These are just some ideas for self care for busy mums- there are many more out there in greater detail. Hopefully having read this you’ll be inspired to make the time for you and to look after yourself. It’s made a huge difference to me, I definitely notice when I’ve neglected my self care. I’d love to hear other people’s ideas, in particular different ways to fit self care in when you’re up the walls! Leave a comment telling me how YOU manage it – and what your favourite you-time treat is! BadMammy is on Facebook and doing updates on life over on Instagram – come over and say hi! I’m getting better at this- but it’s sporadic too. I miss nap time and now evenings are spent at the boys’ matches it’s getting busier! I have 2.5 hours kid free on my parental leave day and I try to spend at least half of that on me, be it going to the gym or sitting in a cafe with a newspaper. It’s what keeps me sane I reckon! I have no idea why I thought I’d be exempt from having these problems after JuggerBaby came along – maybe because I spent all my twenties being the responsible one working my face off to pay off debts, so I’ve been trained well and early on to not cherish me time? But it’s true. Physical health and mental health are two sides of the same coin and need tending to. I’m a fan of the therapeutic massage. Fibro leaves all my muscles in knots so a massage is more like a torture session but it’s also good for me and I haven’t done one in months. I’m hiding in bed during JB’s nap right now, for a short R&R session instead of folding the laundry like I normally might. I piece together bits and pieces, basically. Definitely agree. Self care is so important yet so easily forgotten!